Open for breakfast and dinner, Neomi’s showcases modern American flavors with a South Florida twist. The restaurant’s poolside perch facing Sunny Isles Beach makes it a guest favorite for relaxed fine dining and low-key meetings with clients. Dine indoors or on the terrace. 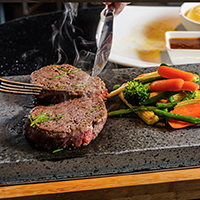 Gather your friends on Neomi's terrace for Lava Stone Grill culinary dining experience using scorching-hot Lave Stones. Also enjoy specialty cocktails and a welcoming atmosphere for a festive evening.